Ever wonder about the room in career services with all the hats hanging along the wall? In it are head covers from all over the world, ranging from navy caps to original Kazakh head covers. “I figured – career counselor – different hats, different roles we take in life, you know?” said Ron Lambert, the director of career services. He is now thinking about what to do with all those hats. Lambert is due to retire at the end of the semester after 19 years at SAIS. Lambert has had a long career in career services. “I have to laugh. I have the same title now that I had when I was 27 years old” he said, referring to a previous job at American University. “Isn’t that sad?” But the title has grown over the years. When Lambert started at SAIS in 1995, the office was a two-man operation with little beyond individual counseling. It now employs 10 people in DC, two in Bologna and one person in Nanjing, and it organizes 10-12 career treks a year and an ever growing number of skills courses (currently at 28). Lambert points out however that the school’s share in the private sector has actually stayed about the same in the past few decades. It is the private sector that has gotten bigger and more international. “Our role is not to suggest to students what they should do. Our role is to help students to discover what their passion is, what they’re good at and where they’ll find satisfaction,” he said. 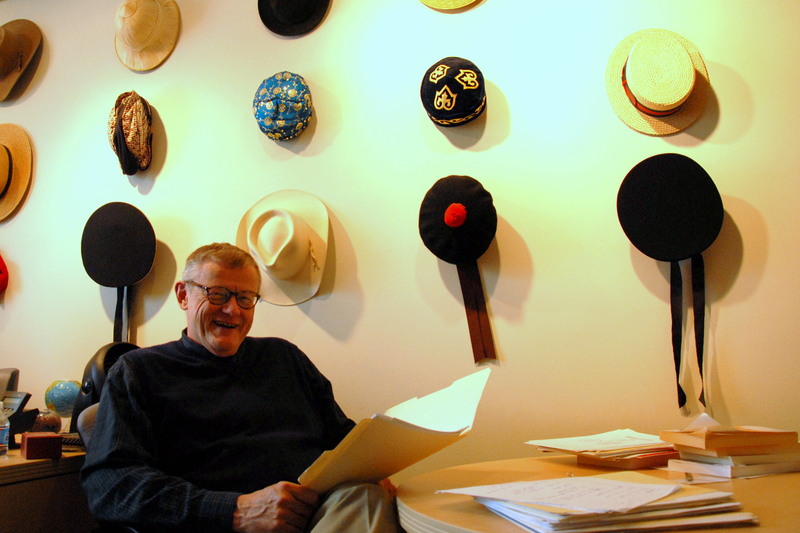 Over the years, Lambert wore lots of hats outside Career Services, too. He has been co-teaching with Professor Keaney the class Leaders & Leadership, where students study great leaders in history and think about their own leadership style and potential. Lambert was also a student at the Johns Hopkins writing program. Perhaps his most important SAIS hat however has been that of a SAIS godfather. Lambert met the father as a student in 1996 and the two became friends after he graduated. Lambert and his wife accompanied the alumnus to a blind date with the woman who would become his wife, attended their wedding and Lambert eventually became godfather to their two daughters. “That is the greatest gift I got from SAIS,” he said. So what is SAIS’ career planner-in-chief planning to do in retirement? He is going to be a trainer at the YMCA. “Here’s my theory,” he said, clearly enjoying the look of surprise on my face. “Boomers like me, a lot of us have worked hard on our careers, maybe put up fitness a little more than we should have. And as we approach retirement, we want to have a very fit, very healthy, very well retirement, and we might not want trainers who are 18 years old and ripped.” So last month, Lambert was officially certified to be a trainer at the YMCA. He is currently doing an unpaid internship training a client who is about as old as he is. He is preparing to work in the couple’s new summer home in Booth Bay, Maine, which happens to have a large YMCA and lots of retired people closeby. “I figure it’s going to be like shooting fish in a barrel,” Lambert says. Lambert expects to be around SAIS for quite a bit still, attending lectures and taking time to talk with students and faculty. We hope the school will continue to benefit from his wisdom and candor. Next The Dragons are Coming!